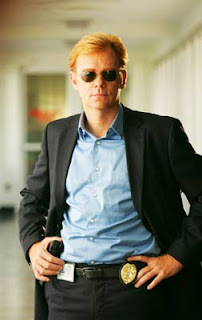 Ramblings of a Civil Servant: Ike, do your impression of David Caruso's career! I can't make it through the whole thing!!! He kills me. CARUSO: "Poo POO poopie...[puts on sunglasses]...poo poopie poo." It proves that his little punchlines are part of the theme music. I originally watched this when Warren Ellis linked to it. He mentioned at the time that someone who worked on the show told him they refer to Caruso's shades on set as the Sunglasses of Justice. Why didn't my link work?